Joining in extracurricular activities will help you to make friends with Japanese students and enrich your experience in Japan. Shinshu University has lots of clubs, often called "SAKURU" in Japanese. For more information on clubs, please refer to the Student Support Center website. Shinshu University Festival is held at each campus from late October to early November. Members of student seminars and extracurricular groups organize concerts, exhibitions and other events in order to present their research and activities. In addition, there is a large variety of food stalls and refreshment booths making this the most popular festival and attracting many visitors. 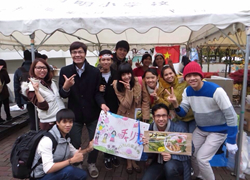 Shinshu University Foreign Student Association always participates in the Festival.